Home / 2014 / May / Congrats, Class of 2014! Congratulations to UC Santa Cruz's Class of 2014! Ideally, we'd profile every one of UCSC's talented, passionate, and determined graduates—but the three students featured here serve as excellent ambassadors for the Class of 2014. They represent the original thinking and fearless inquiry that are the hallmarks of the UC Santa Cruz student experience. These three grads showcase a cross-section of academic disciplines, from history to microbiology and environmental toxicology. 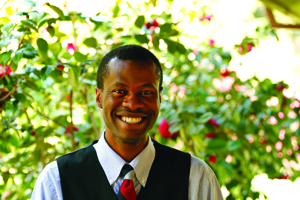 Their stories reveal the transformations they underwent as a result of studying at UCSC. With the power of the innovative education they pursued here, their opportunities will only multiply. 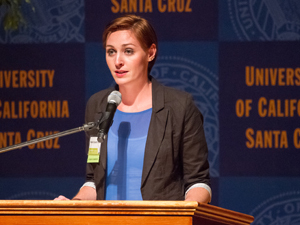 Join us in wishing these students—and every member of UCSC's Class of 2014—the very best. More about commencement 2014. Grad student who came to the U.S. from Nigeria with dreams of becoming a scientist discovers a hidden consequence of fires. History major took a circuitous path to a unique undergraduate research project exploring the complicated world of Okinawa in the 1950s. Cutting-edge research is happening on campus, but few know about it. 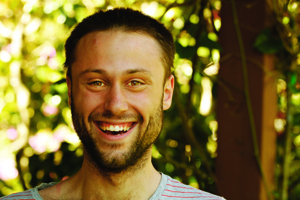 One student's answer—UC Santa Cruz's first student-run scientific magazine.